Become one of the extraordinary Pilot.dog Patreon supporters to see the extended version of the video above. Click here. Colleen from Save A Dog A Day sent out a request to help transfer Holly and her four puppies to their forever homes in New York and Connecticut. Once we heard their story we knew had to play a role in their rescue. Gigi, the foster mom, went to the shelter to save a dog from being euthanized on a particular day. As she was leaving she saw Holly and her five puppies. Holly and her puppies were to be euthanized the next day. Gigi couldn’t let that happen so she went home with all of them too. Gigi had never fostered a mother and babies before and wasn’t sure she was up to it but she said it was the best experience she could of had. Holly was an amazing mom and made things easy for her. Colleen couldn’t find a pilot to fly from South Carolina to Raleigh, North Carolina where we are based so Gigi drove the dogs up to Raleigh herself in a van. She drove five hours in the pouring rain, spent the night and was at the airport early the next morning for our flight. 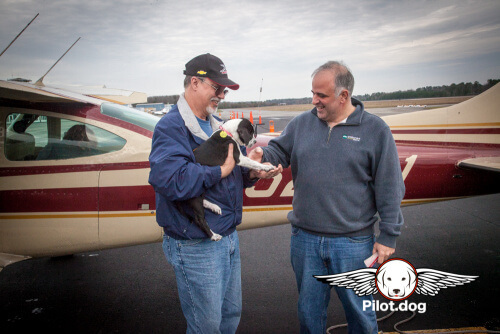 A big thank you is owed to both Plato Pet Treats and Smiling Dog Coffee who donated gifts to us to share with the rescues and pilots we connected with. It’s their way of thanking the service of the volunteers. Please visit Plato Pet Treats and Smiling Dog Coffee because they are awesome. Mike Taylor was our volunteer that day and he and Pam met Gigi in the parking lot. We met several of her dogs who were traveling with her, and Holly. Unfortunately at the last minute Holly’s adoption fell through and she was to go back home with Gigi until they could find her another home. 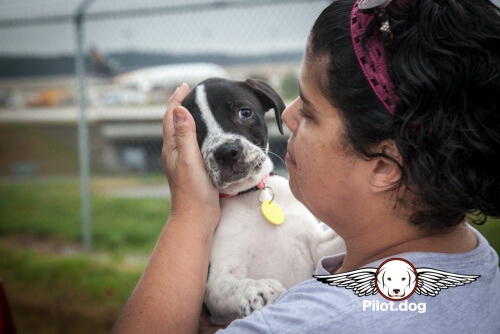 But the mission to fly the puppies was still on and so we loaded the puppies into the plane. Both, Gigi and Holly were so sad to see the pups go. Gigi said she and Holly comforted each other for the next few days, both missing the babies. One of Holly’s five puppies had been adopted by a friend of Gigi’s so she would be able to see him grow up. On our flight was, Noah, Rudy, Emma and Lucy and soon we had them ready for takeoff. Steve and Mike were up front while Pam was in the backseat and the puppies in a crate in the baggage area, protected with all sorts of blankets. 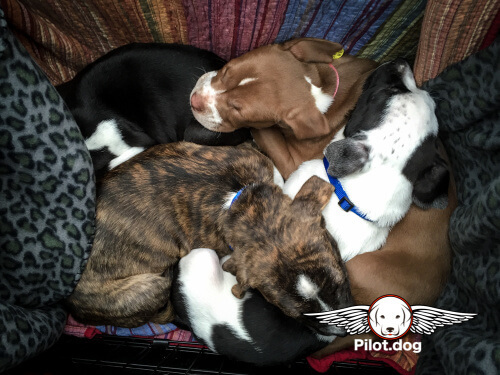 Once we took off, Pam soon had all of the puppies out of the crate and cuddling with her in the backseat. She had blankets all around to keep them warm and comfortable. They were so adorable. Rudy had not been adopted yet but was going to be fostered by Emma’s new family until they could find him a new home. He was a real cuddlier and of course Pam wanted to take him home. Occasionally Pam allowed Mike to have a pup up front but the puppy usually wanted to go back to Pam and their brothers and sisters. Everyone snuggled together and it was a great flight. 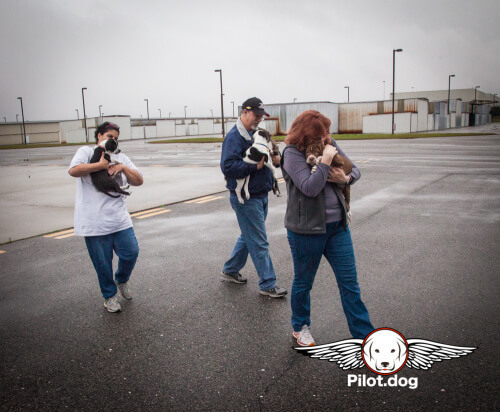 We arrived at Georgetown, Delaware and met Tony, the next pilot fly the dogs to all of their furever homes. 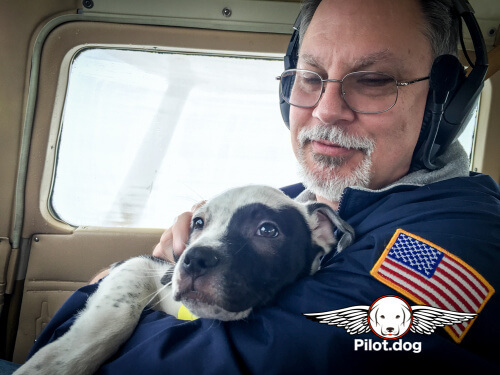 We took a pup at a time to Tony so he could get them settled for their flight. Noah decided he wanted to stay with Pam. He was the last one to get out and Pam took him to Tony’s plane. Neither wanted to let go of the other. The look he gave her tore at her heart when she loaded him into the crate and closed the door. As usual another tearful goodbye was said. After an exchange of hugs, and some much needed lunch we departed for Raleigh. The flight home was non eventful and Mike told us about his Huskies and how they were rescued. His female Husky is a therapy dog at Rex Hospital in Raleigh. Evidently to get your dog on the approved list at the hospital you need to call them and they will tell you what paperwork is needed and who your dog has to see to get approved. It’s really a great help give patients a little comfort and relaxation while in the hospital. We heard back from all of the dogs owners except Noah. Gigi and I were so worried about him. Then, Tony sent us a picture of Noah surrounded by 3 happy children petting him at the airport. We knew then that he would be well loved and cared for. To see loads of mission photos, click here.